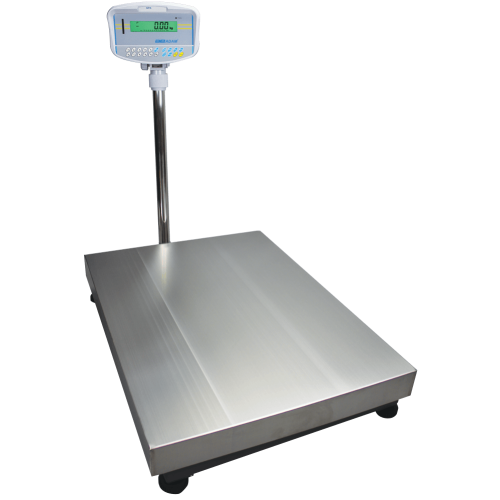 Adam's GFK checkweighing floor scale capably performs check-counting to a predefined weight or count. The GFK comes with a full keypad that simplifies unit weight and sample entry. A durable stainless steel platform and pillar-mounted ABS plastic indicator make the GFK suitable for parts counting and weighing applications in warehouse environments. The large back-lit display is visible in most settings and shows unit weight, total weight and number of pieces. The GFK checkweighing scale is designed for verifying the weight of large boxes, crates and containers in warehouse and factory environments. Inventory control tasks are simplified thanks to the GFK's ability to check the weight of items prior to placing on shelves or storage. The GFK also offers a dynamic weighing feature that can be used to weigh medium-sized animals and pets such as dogs with ease. The stainless steel top pan makes the scale easy to clean down after use. The GFK features a large weighing area that can be used to checkweigh multiple containers of chemicals at once. The stainless steel top pan is chemical-resistant to withstand accidental spillage. You’ll see the word “approved” on websites selling weighing scales and balances (also called legal for trade, certifed scales or trade approved scales), particularly if you’re looking for a retail or commercial scale. What exactly does ‘approved’ mean?